When it came out in 1911 with the world's first, modern, semi-automatic pistol, the 45 ACP quickly became one of the most popular rounds in America. Today, it is still numbered among the top rounds for self defense. With its phenomenal capacity for stopping power, damage, and effectiveness, this round is just what you need. These 185 grain, solid copper hollow point rounds fire at 1100 feet per second and provide the performance that only solid copper rounds can provide. 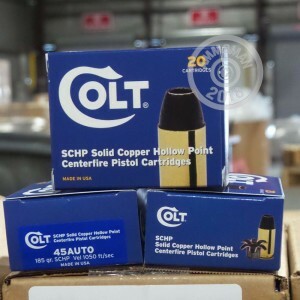 With fantastic expansion and damage capacity, these 45 ACP rounds from Colt, the original manufacturer of this favorite round, give you just what you need to stop your assailants. I bought this ammo from Ammoman back when it was offered in 200rd cases. Picked up 2 of them and wish I'd bought 5. It fed flawlessly through all of my Colt 1911's and gave me 2" 5 shot groups at 15 yds offhand. It has plenty of punch hitting 8" AR- 400 plates. Shooting 4" thick jugs of frozen jello at the same distance produced a large rupture in the back side and took the jug down hard. The slug didn't make it all the way through and when it was recovered it was a perfect example of maximum expansion. There is an illustration on the box showing a "fully petaled" round and it is no exaggeration. As most shooters of 45acp know it is quite easy to spend upwards of $20.00 for a 20rd box of defensive ammo. This stuff delivers a hell of a lot of shock at a reasonable price.